Here's what happened: at home, Little J had been tormenting playing with Baby E. In order to distract him away from her, I asked him to help me choose some shoes. 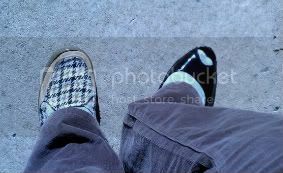 I was going to wear the brown plaid loafers (on the left), and he wanted me to wear the black patent leather heels (on the right). He wouldn't drop it, so I put on the black shoe to appease him, and figured I would just change it later when he wasn't watching. Apparently I forgot. Nice.